Releasing Passengers over the holidays is a ballsy move. People are traveling, occupied with family, and snuggling up to the fireplace. But the film, starring Chris Pratt and Jennifer Lawrence, isn’t like other holiday fare. Set among the vast backdrop of space, it tells of the murky moral dilemma one man faces knowing he could die alone. 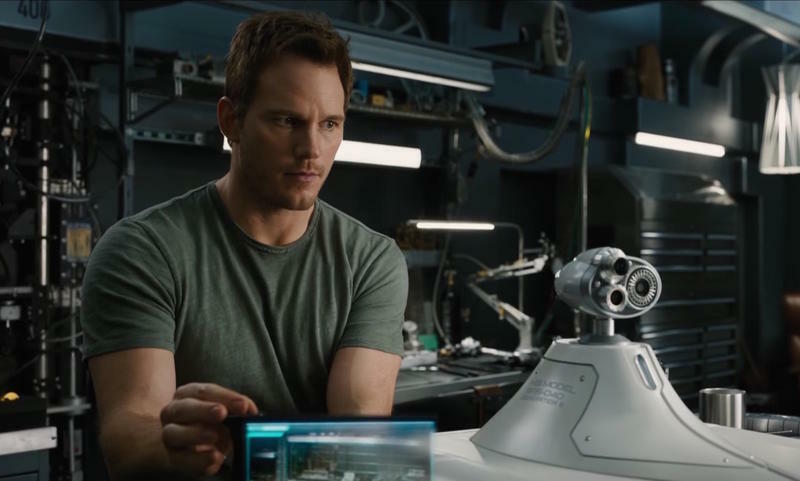 Aboard a spaceship headed for Homestead II on a 120-year journey, mechanical engineer Jim Preston (Chris Pratt) wakes up from suspended animation 90 years too early. With no way to get help or go back to sleep, Preston confronts his new life of extreme isolation while the 5,000 other passengers on the ship remain asleep, headed toward an idilic paradise. About a year after waking up, we find Jim consumed by his loneliness and at his last wit’s end. He finds hope when he crosses paths with a sleeping passenger named Aurora Lane (Jennifer Lawrence), who he ultimately decides to wake up. It’s an incredibly selfish act, and a bleak theme not seen in other Hollywood love stories. We spoke with Passengers writer Jon Spaihts (Prometheus, Doctor Strange) about Jim’s dilemma and how the ending evolved during the movie’s long development, which began all the way back in 2007. We also asked Spaihts about whether there was ever any temptation to introduce aliens into the script. The movie does, after all, take place in space. Creating a film that presents audiences with questions of morality, isolation, and the value of life has been immensely gratifying for Spaihts, who says the movie was made faithfully by director Morten Tyldum. “The aesthetics and the sensibilities from the script are present in the film; it’s very honorably treated and that’s a rare thing in such a big Hollywood film,” Spaihts said. That vision, it turns out, never involved aliens or a mysterious supernatural threat. Big budget Hollywood films often fall back on familiar tropes as their big twist, but Passengers never uses them as a copout, which in turn allows the film to focus on Jim, what he has done to Aurora, and he how hides his guilt from her. Although Jim isn’t your typical antagonist, he does make a selfish decision when he wakes Aurora up. Still, the movie manages to make him likable, against our better judgments. Indeed, it’s a difficult question to grapple with. When you’re confronted with such immense isolation, human contact is capable of bringing a person back from the brink of suicide, as it did for Jim. Unfortunately, Jim’s decision and how Aurora deals with it are overpowered by a more conventional third act, which sees the two rescue the ship from destruction. Despite its faults, the movie has an authenticity that’s made stronger thanks to the movie’s science, which Spaiths said was important to get right. Adding to Passengers’ authenticity is the ship’s incredible design, which Spaiths revealed was the brainchild of Guy Dyas, the film’s production designer. Combined, Jim’s decision, the backdrop of space, and the gorgeous scenery make for a compelling movie that raises some strong questions about morality and loneliness. If you could wake someone up early to keep you company, would you do it? Passengers is out now in theaters everywhere.